If at first a joke doesn’t succeed, tell it and tell it again. This seems to be a mantra of “The Internship,” a film that mostly takes place on the campus of a company known for innovation yet is a comedy that is entirely derivative and sluggish. The film’s comedy is based on setting up a scenario and then repeating a punch line over and over. Technology-challenged friends can’t figure out the framing of a webcam. A character repeats the phrase “on the line” instead of “online” about 10 times in succession. The wonderment of free food at Google headquarters leads to asking to take about 10 different specific items. Numerous random callbacks to the movie “Flashdance.” And so on. It’s not like the movie needed filler, either. “The Internship” clocks in at an excruciating and completely unnecessary 2 hours that drag to an inevitable conclusion to whatever threadbare plotlines that existed (and a few new ones thrown in just for the heck of it in the last five minutes). 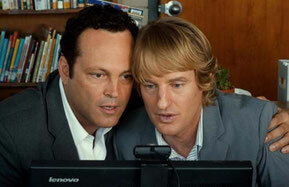 In the first of the film’s string of clunky scenes, salesmen Billy McMahon and Nick Campbell (Vince Vaughn and Owen Wilson) are notified by a client that their watch company has gone out of business. “Everything’s computerized now” their boss (John Goodman, in his second throwaway comedy role in the last few weeks) helpfully explains to them. Billy also loses his girlfriend and home for good measure. For no apparent reason, Billy Googles Google and finds out about an internship at the tech company which would in no way be a fit for him or Nick. Yet, he approaches Nick at his new gig – salesman at a mattress store – and convinces him that this is a good idea. This scene does provide a sort-of laugh with the tattoo of Nick’s boss (a maginally funny cameo). The pace does not pick up when Nick and Billy arrive at Google and all we’re treated to are a collection of tired attempts at humor. Vaughn and Wilson display no real desire to actually be funny and instead seem contented to let the underdog story of out-of-touch old-timers desperate to land a fulltime job play out as clichéd as possible. Nick and Billy are put on an intern team of outcasts (all defined by one shallow character trait) that have to perform in a series of challenges against other, better teams – primarily the team of the head villain and just all around jerk Graham (Max Minghella). Jeez, how will our lovable losers ever prevail? I was not on pins and needles. There’s the boss that’s always mean (Aasif Mandavi). There’s a love interest because there has to be one. Nick courts an attractive Google workaholic manager (Rose Byrne), who is at first icy to his advances but, only because the script requires her to, quickly warms to his charms. Both of these customary characters are ones we’ve seen countless times before and they’re even less interesting here. Standard is one thing, but insufferable is another and that’s exactly what the character of Lyle (Josh Brener) is. Lyle is the team leader of the Google outcast interns and we know he’s a nerd because he has glasses, wears “Star Wars” shirts and says things awkwardly. He also speaks in a quasi-urban language that might be offensive if it wasn’t so stupid or his voice so annoying. Just hearing him talk is a grating, joyless experience – sort of the like the movie as a whole. Formulaic and trite, “The Internship” sets up an exhausted situation, fills its overlong runtime with unfunny jokes and provides no payoffs. At least Google got a two-hour commercial.